Ever since I finished researching Udaipur Budget Hotels, I knew I had to cover Jaipur next. For anyone who is planning a Rajasthan holiday, Jaipur is usually included in the travel plan. If you’re planning an extravagant vacation in Jaipur – here are my top 5 Jaipur Luxury Heritage Hotels suggestions on a budget! The pink city of Jaipur has long been a tourist hub for both national and international guests. Depending on the season you travel, prices of hotels and heritage property can vary upwards 40%. It thus makes sense to plan in advance. Check for prices of accommodations for various months if you are a budget, conscious traveller. In this post, I will be sharing Jaipur Luxury Heritage Hotels in the mid-budget range. 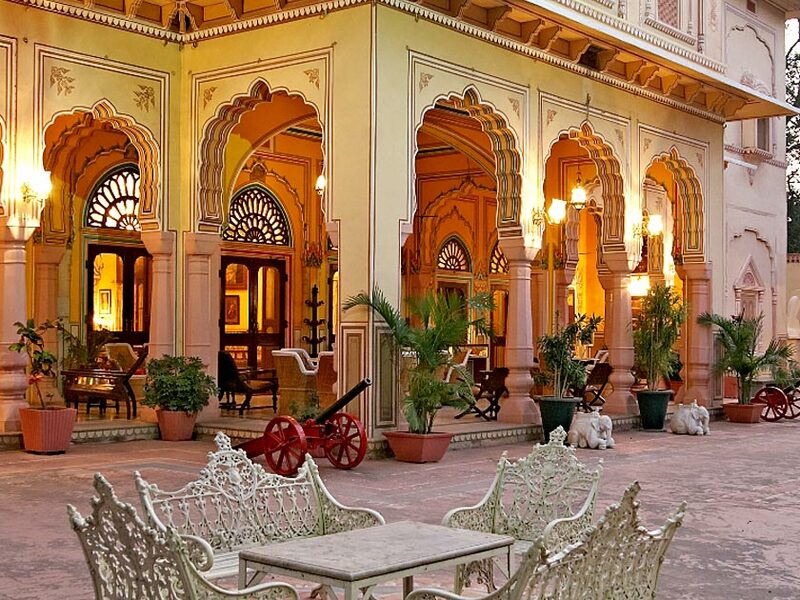 The price range of Jaipur Luxury Heritage Hotels will be between INR 3000 to INR 6000. Please note that the prices shared are for the month of August. August is an off-season time for visiting Jaipur. But the idea behind sharing these luxury properties is so you know what you can rent at your budget. Before booking your stay, try and see the distance between the hotel and popular destinations like City Palace Jaipur. This is the first Jaipur Luxury Heritage Hotels that caught my eye. The beautiful exterior teamed with that mid-range budget makes it affordable for the mass population. Keep in mind, this is off-season prices we are talking about. So if you have a certain luxury staycation in mind for Jaipur, Alsisar Heritage Hotel is a fantastic option to go for. More than five centuries ago, the grandson of Maharaja Udaikaran of Amer, the great warrior Maharao Shekhaji, founded a sub-clan popularly known as “Shekhawat”. The Alsisar Hotels is owned by this branch of the “Kachawa” clan of Rajputs. The descendants of the family have since restructured and refurbished many of the old family mansions and palaces to manage a portfolio of some of the best heritage and luxury hotels. Built in 1892, a nobleman’s town house, restored to perfection, Alsisar Haveli lies tucked away in the heart of Pink City of Jaipur. Converted to a heritage hotel in 1994, Alsisar Haveli Jaipur has been aesthetically redesigned, incorporating in itself the grandeur of traditional Rajput architecture with rambling courtyards, serene alcoves and lush greenery. The first thing you notice about this heritage property is that ginormous gold entrance. It has a Mughal tough to its architecture and is perfect for a royal stay experience in Jaipur. A bit on the pricier side, but well worth it if your agenda is to relax and enjoy a weekend away from your daily routine. Look for comparative prices before choosing to book your preferred choice of hotel. I always look at Booking.com, TripAdvisor and check for prices. Make sure you go till the final payment page to know that there are no additional hidden charges or taxes levied on top of the prices mentioned. A good norm is to also ring up the hotel directly and check for prices. A lot of time, hotels themselves give out the best prices. Additionally, you can also check prices through the hotel’s official website. The palace was built in the year 1928 by General Amar Singh Ji, the then Thakur of Kanota. Designed in the Anglo-Indian style popular in the victorian era, the palace, which served as the country resort for the Kanota royalty, is now one of the best heritage hotels one can witness in present times. Shahpura (Manoharpur) is the head seat of the Shekhawat Clan of Rajput’s and the famous Shekhawati derives its name from it. It is named after the founder ruler of Shekhawat Maha Rao Shekhaji and the Manoharpur Shahpura Family takes pride in being direct descendent — from Maha Rao Shekhaji. As one drives past the town on the left of the road towards west of the highway leads to the Haveli. Set amidst green surroundings this place is typical of Shekhawati, and 300 years old created by Rao Pratap Singh. After that Rao Dhir Singh gave the buildings at Shahpura a face lift. He also restructured and refurnished their old palatial house in Jaipur, which was converted into a Hotel in 1991-92 by Maharaj Surendra Singh ji and named as SHAHPURA HOUSE. Located just 20-minute drive from the City Palace, this gorgeous heritage property is worth shortlisting if you wish to live royal style in a stylish luxury heritage property.